I finally got the girls into a Mother's Day Out program and I am so looking forward to them going to school. They will be going Monday, Wednesday, and Friday for 4 hours each day. It will be so good for them to have other kids their age to play with and to be with someone other than me for a little while. The past 2 times we have taken them to the church nursery they have been out in the hall crying when we picked them up! Their teacher said, "they just hate being in this room"....no, they just hate being away from their mommy. So, hopefully they will do okay after a week or so of going to school...I feel sorry for their teacher! The girls are both walking now. Taylor has been walking around like a little baby Frankenstein with her arms out front for about 2 weeks and Sutton just started last week. Sutton walks like a little Sumo wrestler w/ her legs far apart. I will try to upload some video of them bumbling around later tonight. They are EVERYWHERE now...they can't be contained. They have been able to climb onto the sofa by themselves for about a week now and my entire floor around the sofa is lined with pillows. They both had a major fall out of the chair onto the hardwoods last week but survived with minor bruising. They are going to give me a heart attack! We are taking the girls to have their 1 year pictures made this Sunday so you will all be getting more photos than you can stand soon! Yes, I know they are 13 months now but if you go by their adjusted age, we are actually ahead of the schedule...that's my story and I'm sticking to it. Where do I start? The girls had both been sick for a week prior with a bad head cold and cough. We were determined to go on with the party though. 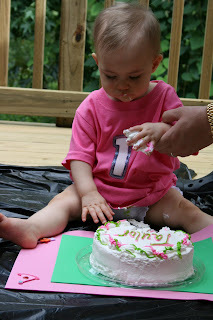 You only have a 1st birthday once! I was so focused on trying to get the girls into the t-shirts, onto the plastic, get the cakes laid out in front of them, get Shea to take pictures, get Todd to video that I did not even realize until later that night that we did not even sing happy birthday! How horrible is that????? 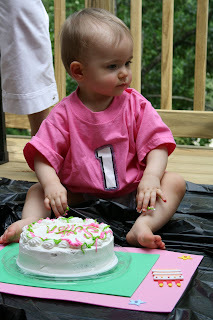 Poor Sutton threw up immediately after taking her first bite of cake (they have never had any sweets until then). I don't know if it was that she was sick, worn out by the time we got to the cake fiasco, or just didn't like it. Taylor chowed down on hers...my little Mikey will eat darn near anything! 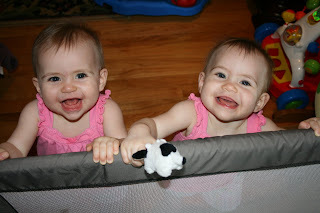 I am creating this blog as a way to keep friends and family updated on Sutton & Taylor as they grow. It's already been a year and it just flew by! I wish I had been doing this all along but better late than never, right?